If a shorter duration is required for your stay, please contact the owner. About the property, recently built condominium suite, fully furnished by BoConcept and Modani. Pictures as seen, sophistically suited for those to enjoy Toronto's Yorkville and downtown core. Minutes walk to the subway. Building features includes the entire 5th floor devoted to amenities: fitness and weight rooms, change rooms, steam and sauna rooms, party room, library, cocktail lounge, and outdoor large wrap around rooftop garden (comes complete with lounge chairs, bbqs, etc). The property unit boasts unbeatable southern and western views from the living room, bedroom and walk-out balcony, with lots of natural light. The unit offers complimentary underground storage locker, portable baby crib (optional), electric pump blow up mattress (optional) hydro, Bell Fibe TV, and unlimited internet. In-unit stacked laundry washer /dryer machines, Miele appliances: dishwasher, stovetop, fridge, with full kitchen stocked with all necessities. The master bedroom comes complete with 1000 thread count Egyptian cotton bedding, and all bathroom supplies are all included. Secured underground parking available at an additional cost, subject to availability. This downtown apartment has allowed me to make the most of Toronto - quite apart from its stunning, uninterrupted views across the city, which includes a Lake Ontario horizon. The lake glows at sunrise and sparkles throughout the day and, after watching the sunset, the nighttime view of city lights is just stunning. With two full living room walls of window facing South and West, the apartment catches every bit of sunshine possible - an important feature for me. That said, being up so high with so much glass enables all weather conditions to be enjoyed - including being in the clouds or watching storms sweep across the lake and city. Transit is within easy reach, with the Wellesley subway station just around the corner. The cream of Toronto's Bloor Street / Yorkville shopping is only a few blocks away. I do enjoy walking and have walked to Eaton Centre and on to the waterfront, St Lawrence markets and the Distillery district (recommended! ), and in the other direction the Kensington markets and Chinatown. It's also worth noting that Stop 1 of the hop-on hop-off bus is just across the road from the apartment on Yonge Street - when I arrive in a new city I usually do a city tour to help me get my bearings. John has furnished the home tastefully - I enjoy the peace and quiet and lack of clutter. It is a well-designed and well-appointed apartment, and John has made an effort to ensure it has everything needed for a comfortable stay. I highly recommend this apartment. Wonderful location, view, apartment and host. Highly recommend. Fantastic Unit in a great location! We rented this unit for four weeks in August. The unit is exactly as the owner has described it on the site. The location is perfect, close to the subway and is in walking distance to nice restaurants, grocery stores, entertainment venues, museums, parks, and colleges. The unit has everything you will need to feel at home. The unit is very clean and is very up-to-date with the current amenities. The kitchen is well stocked will all the the dishes and cooking utensils you would need to make a nice meal. The bathroom shower is very nice with an overhead shower head along with a hand held sprayer. There is a nice balcony where you can sit, have a nice beverage and see a beautifully sunset. The owner is very professional and easy to work with. Any questions you may have were answered in a timely manner. If this unit is available, I would highly recommend renting it. The next time we are back in Toronto, we will definitely rent this unit. The condo is beautiful in a lively, central part of the city. You can walk to everything including restaurants, groceries, the Dollarama (fun store), Bloor and Yonge, etc. The Wellesley subway stop is only one block away. The owner was easy to work with and always got back to me very quickly with answers to questions. Thr condo decor is stylish and the view is truly amazing. It was helpful to have a powder room bathroom in addition to the master bath. There is a deep soaking tub with rain shower + handheld in the master bath. The bedroom is tight with just enough room for a queen bed and little tables as nightstands. There is no dresser but there was lots of closet space including a hanging shelf. This worked out fine for us but something to be aware of. Thank you so much for sharing wonderful words about your experience with me and the impression of your stay. You and your family were an absolute pleasure to host, truly respectful, communicative and very easy to accommodate. I hope I receive wonderful guests like yourself in the future, and you're always welcomed back with open arms! Beautiful condo in very convenient location close to shopping area and supermarket, fantastic views, fully furnished and very comfortable. Less than 10mins walk from the beautiful Yorkville and only 3mins from the underground and the University of Toronto, within walking distance from the Eaton Centre and Nathan Philips Square. I've spent one month in the condo and really enjoyed my stay there, I truly felt at home and the landlord was very helpful, accommodating every need and helping whenever needed. 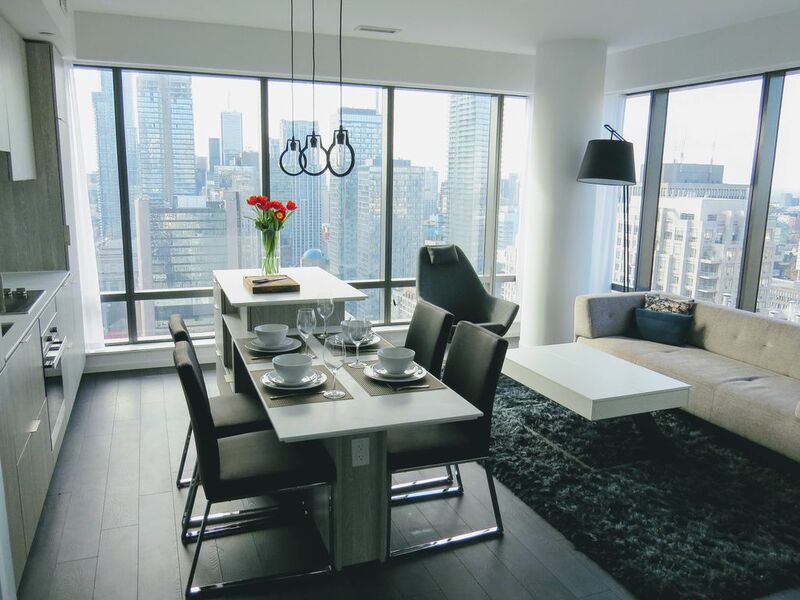 Great condo to experience Toronto and feel like a local, I definitely recommend it! Thank you so much for your positive review. It was truly enjoyable to have you as my guest, and was happy to make your stay comfortable. Truly a match made in heaven, I wish you had the opportunity to stay longer!